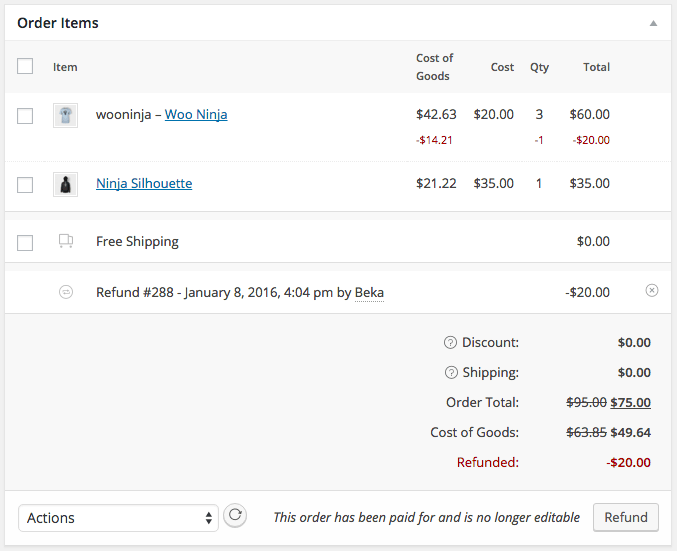 WooCommerce Cost of Goods v2.0 was recently released. This update brings significant improvements to reporting and refund handling, as well as support for the REST API and other minor fixes. Let’s dive in! 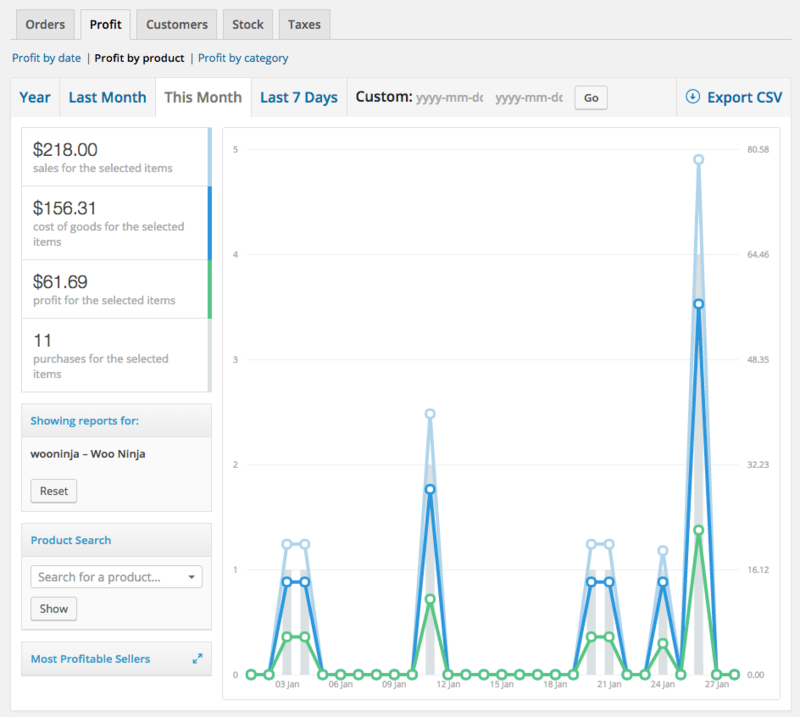 Profit reports now match core WooCommerce reports and have a refreshed design, along with quick access to various date periods. 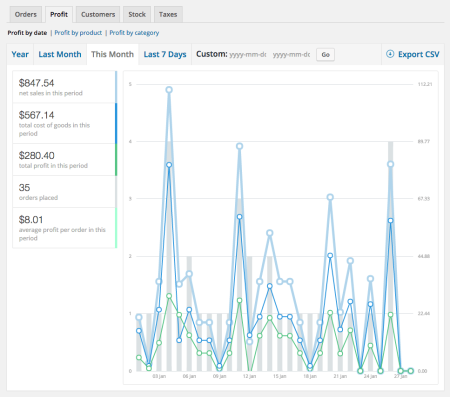 In addition, you can now export your chart data to CSV! 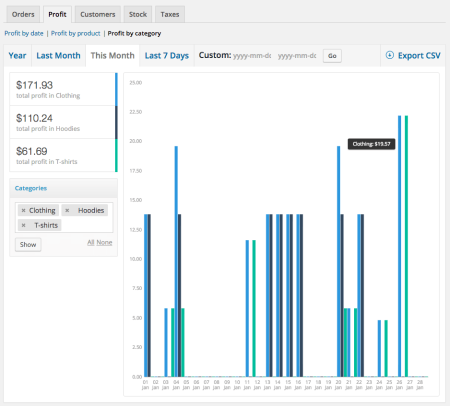 The Profit by Product report includes a new widget to show your most profitable (or least profitable) sellers in the date range you’ve selected, and you can click on the product name to quickly see the total profit and cost of goods over the date range. We’ve changed to a standard line chart over a simple bar chart from the previous version and we think you’ll love the new look. 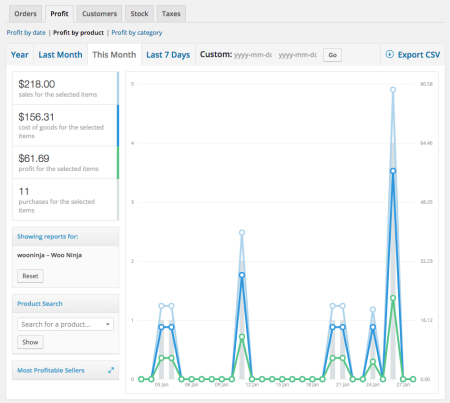 We’ve also added a new report, Profit by Category. 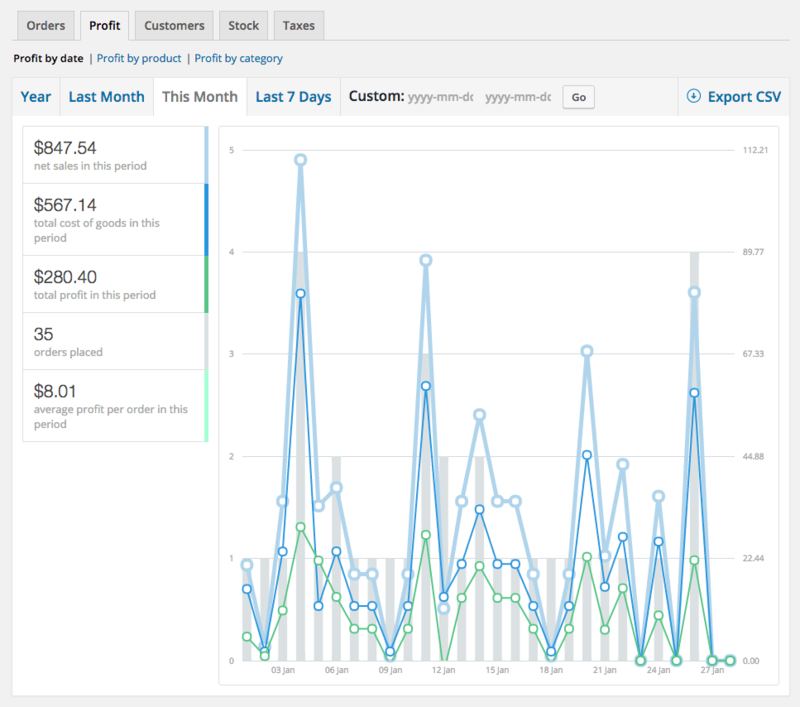 It includes a category selector where you can choose one or more product categories to get an overview of profit for those categories in the chosen date range. If you select a parent category (such as “clothing”), the profit and cost report will include data for all child categories as well (such as “hoodies” and “tee shirts”). 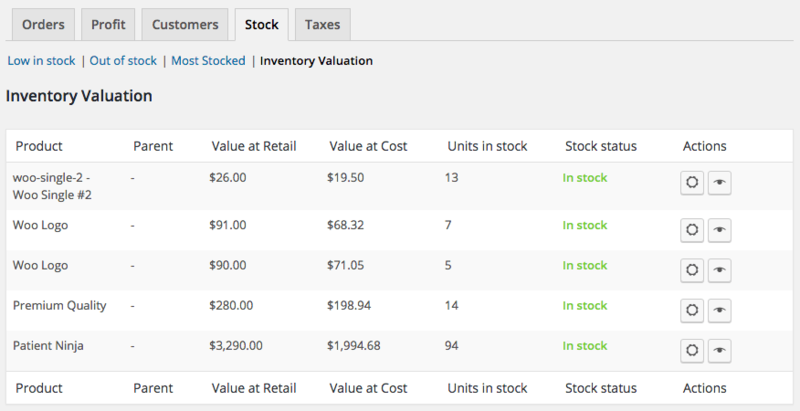 The Inventory Valuation reports have been updated to use a table format so they’re easier to read. Sometimes you need to run more advanced reports or calculation than the built-in reports, so we’ve added a few ways to export your cost data in this release. First, the Profit by Date/Product/Category reports include an “Export to CSV” button that exports the chart data as a CSV. 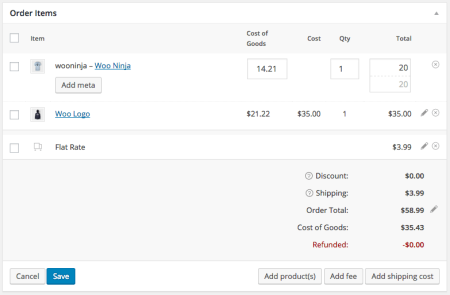 Second, we’ve added support for the WooCommerce REST API so that cost data is included in the orders and products GET endpoints. If you need to be able to set cost data for orders or products, please contact us so we can add it to the roadmap for a future release. Finally, we’ve added native support for the Customer/Order XML export plugin. The exported XML file now includes the ItemCost, LineCostTotal, and OrderCostTotal elements. This is in addition to native support for both the Customer/Order CSV Export plugin and the Product CSV Import/Export plugin. 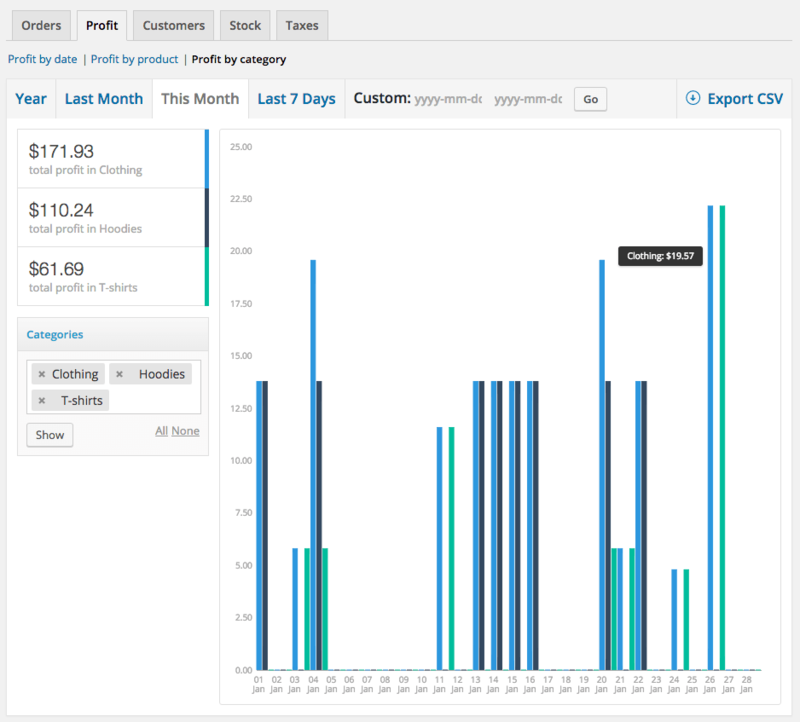 You can now edit the line item total cost for editable orders (such as pending or on-hold orders). This will automatically adjust the total order cost. I must be missing something… …I have both the Cost Of Goods plugin and the Customer/Order CSV Export plugin installed and I still don’t see the “Export To CSV” pictured above. Am I missing something? Is there a place where this needs to be toggled on and off. All plugins, WooCommerce, Cost of Goods, Customer/Order CSV Export, are up to date (as well as everything else in use) but the option to Export To CSV still isn’t visible on any of the report pages. I was viewing it in Safari, after reading that I tried in Chrome and sure enough, there it was, clear as day… “Export to CSV”. Hey Tony, glad you found that and thanks for reporting back! I’ll definitely get that added to our Cost of Goods documentation as well. Cheers! Hey Ole, the plugin can be used in a staging / dev shop, but a license can only be used on one site, so we recommend activating this on your live site for updates / support. – Does this plug in also total stock values at Wholesale price and at cost price? – This feature is for me ore important than the ability to calculate profit and loss, because I have that already off-line in my bookkeeping program. So my question is do you have a plugin for doing only that, the calculation of the stock value at retail price? Which plugin would presumable not as heavy on the resources to slow down the system and less to look out for? -Is the above plugin version 2.2.7 ? 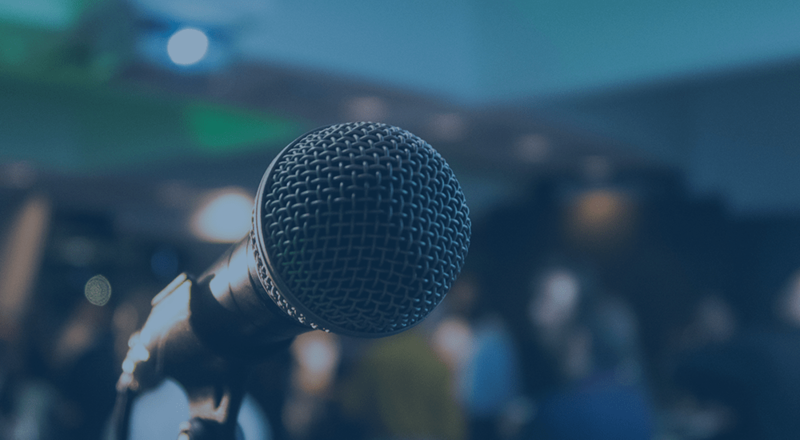 Look forward to your answer, Kind Regards, Jan.
Hey Jan, the plugin will provide a total valuation at the purchase price (what’s set as the regular price) and at cost. If your wholesale price is added a different way / uses a different value than regular price, then I’m afraid this won’t be considered for the valuation reports since that’s not a WooCommerce core feature. So my question is do you have a plugin for doing only that, the calculation of the stock value at retail price? I’m afraid we don’t have a plugin to calculate valuation at only retail price since this plugin does it already, though there shouldn’t be any resource slow down due to the way the total valuation is calculated. 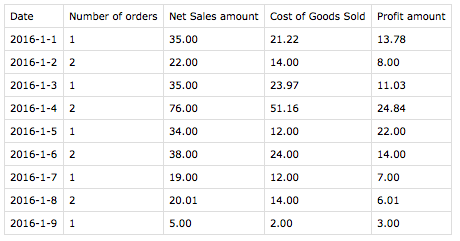 How to add Cost of Goods*Quantity for products to table (ro Edit Order page)? I need add Cost of Goods, Products Cost of Goods*Quantity (in table), total Cost of Goods, Price, Total price, Amount, Shipping method, Billing method (in Print Packing List – skyverge). I need add Cost of Goods, Cost of Goods*Quantity for products to table, and total Cost of Goods, Products Weight (in table), Total Weight (in Print Invoice – skyverge). And i need delete SKU in Print Invoice, Print Packing List – skyverge. Please, Help me. How do it? I am curious how this works as the prices we pay vary month to month. 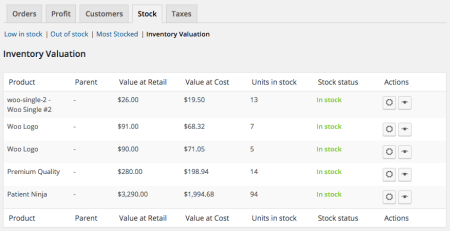 Is it built in that when you add stock, it leaves the remaining stock at the previous purchase price and the new stock level at the current purchase price? 1. Is there real, active development going on on this plugin? The article starts “WooCommerce Cost of Goods v2.0 was recently released” – but that seem to have been posted 2 years ago almost. 2. 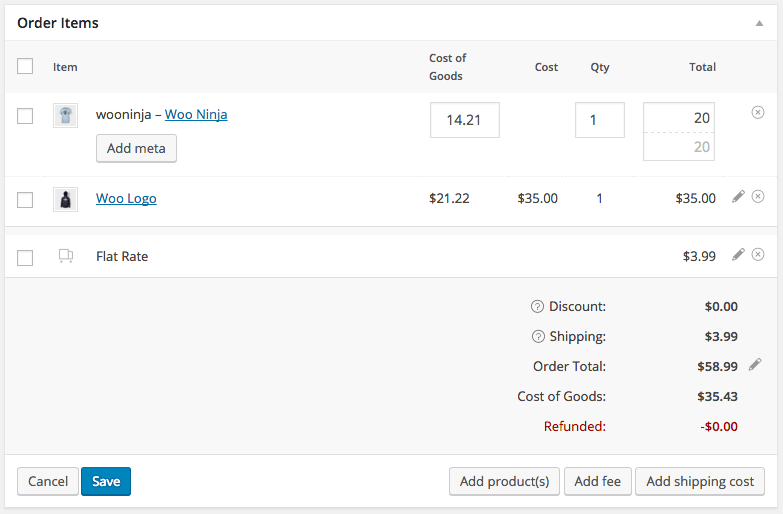 Booster.io also has Cost of goods in their package, but I would prefer having a more dedicated plugin like yours, with more functions related to cost of goods (like reporting). However, you only have ONE cost price and to us that is huge disadvantage. Would you consider adding the opportunity to use additional cost fields, like Booster.io have. i.e. I believe that should not be such a big task and it would greatly improve the data accuracy and value of the reports. Hey Stan, as you can see from the changelog, there’s certainly active development. We don’t update historical blog posts with every release, which is why the original publish date is still present. We have shipping costs on our list, but we don’t have additional price fields on the roadmap for this plugins. As for affiliate referrals, we’ve looked at integrating with AffiliateWP, but that’s not yet on our roadmap as it only has one other vote thus far. We try to prioritize new features based on votes just like this, so thanks for the feedback here! I’ve now added your notes as well. I am thinking about using Woocommerce + Warehouse Plugin to manage my warehouse. I am planning to use your Plugin to keep track of cost. However, we import goods from another country, cost of goods changes each time shipment is received. For accounting purposes, cost of goods for products already in the warehouse must not change each time we enter the new cost of goods. However, If we have 5 of A at cost $10 left and we have new shipment of A at $20 cost then Cost of goods is now average of $15 and total cost of goods of A is $150. Not sure if that makes sense but does your system keep track of Cost of goods this way or does it just update all cost of goods to latest figure entered? Hey Kevin, the cost is manually entered, so you’d be required to do this average yourself. So for example, if you’d previously set the cost to $10, and you changed it to $20, all items will now have cost recorded as $20. So previous orders will not change as they store a historical cost, but inventory isn’t “tied” to a historical cost. 1) Does this plugin play nice with the dropshipper plugin?